I adore Esther’s story. It was a favorite as I was growing up. Esther’s story is precious to a lot of women, almost as though it was a little gift for us tucked into the Old Testament. But it’s not so dear to us for the obvious rags to riches reasons. True, Esther was elegant and a rare beauty, but more importantly Esther’s story reveals that women who commit to prayer and walk faithfully with God can be used, mightily for His kingdom. I don’t know about you, but I’d rather be useful to God than be a beautiful queen, any day. This little verse is a beautiful picture of our care in our Creator’s hands. Mordecai adopted Esther when she was orphaned and later, when she became a part of the royal court, Mordecai watched over her, without missing a day, as she was being prepared for her purpose. Can you just let that sink in for a moment? Mordecai watched over Esther in his human power, in his human love, but he did so daily. How much more is the Almighty watching over each and every aspect of our lives, every detail? We go through trials, we go through tests, we live our lives, we are being prepared for our purpose, and God never misses a moment. Praise God, He is faithful to His children! Now for a sweet surprise! Each week on our Blogging Through the Bible Recap we’ll be including a free 5 x 7 printable featuring a verse from that weeks reading! We encourage you to print it out and add it to a prayer journal or stash it in your Bible! Just click on the pic to take you to a dropbox link where you can easily download and print this 5×7 image! 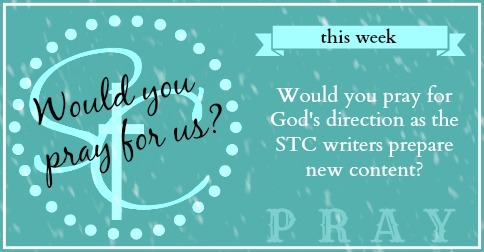 Thanks for joining us for our first weekly recap of the Blogging Through the Bible series! Don’t forget to stop by Women Living Well for all the details of this journey! Hey friends! Sundays here at STC are also our “Weekly Prayer” Days. We post a prayer request each week and ask our readers to pray for us! It’s a quick thing, but we are SO grateful for everyone who takes time to lift us up. Read more about our Sunday Blog Prayer. Here is a brief sum up of what the weekly blog prayer post is all about! The story of Esther is one of my favorites for the very reason you’ve pointed out in your post. I often struggle with self-doubt and worth issues especially during trials. The amazing story of Esther serves as a reminder of His constant love and care for me. Yes, isn’t it such a precious reminder? 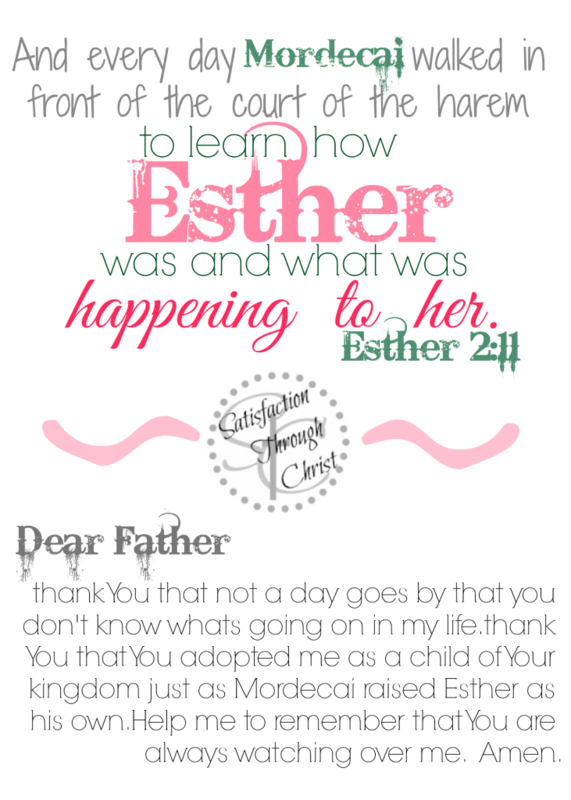 God was so good to include Esther’s story in His Word! Thanks for stopping by Jenn! Have a wonderful Sunday!